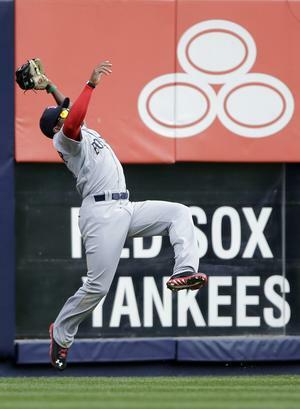 Jackie Bradley Jr. made a nice catch Monday. Baseball is back, and for the record everything I'm about to say has nothing to do with Boston's 8-2 win in the Bronx this afternoon. In fact, anybody who has a different opinion of the Sox chances this season now than they did yesterday should have their head examined. Opening Day means nothing. The Astros are supposed to be one of the worst teams in baseball history, and they beat the Rangers easily on Sunday night. The prevailing outlook on the 2013 Red Sox seems to be that they will be lucky to compete in the AL East. I don't understand this at all. ESPN picked them to finish last. That could well happen, but I also think they are just as likely to finish first. In my mind the entire division is a crap shoot. We could end up with 5 teams winning between 80 and 90 games. That same ESPN article actually agrees somewhat with this; it projects the 1st place Blue Jays best case scenario at 98 wins, but also says Boston has the potential to end up with 93.
Who should the Sox really be afraid of? Did you see the lineup the Yankees threw out there today? I wasn't feeling so hot about Boston hitting Mike Napoli in the cleanup spot, until I looked over and noticed New York was batting Kevin Youkilis 4th. The Orioles won 93 games and made the playoffs in 2012, but they also only outscored their opponents by 7 runs all year (712-705). Statistically it was one of the luckiest seasons in baseball history, those numbers suggests they should have finished around .500 or just over. One of the main reason's Toronto is supposed to be good is the acquisition knuckleballer of R.A. Dickey. I know he won the NL Cy Young award last year, but Tim Wakefield was dominant once upon a time too. That leaves the Rays, who I think are pretty solid and most likely of all to win the AL East. But, I'll be the first to admit there's about an 80% chance I'm wrong.